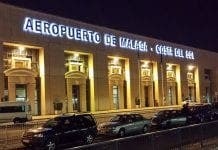 MALAGA Airport’s falcons are being readied for action. A group of falcons will be used to prevent other birds from interrupting takeoffs and landings – a significant threat to flight safety. It’s just one of the quirky measures the airport’s wildlife committee will put in place to ensure flight safety this summer. Other issues discussed in a recent meeting include cutting down the number of unauthorised landfill sites which attract flocks of birds in the Guadalhorce valley area. The committee also talked about controlling the amount of unauthorised pigeon coups, and removing nearby ponds. 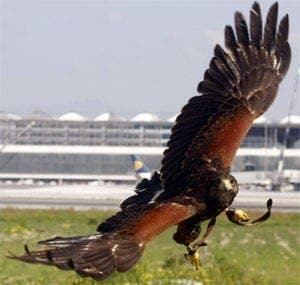 The airport have been using falcons for years to prevent bird strikes. This year the need is all the more great, with millions set to arrive on the Costa del Sol. The photo appears to show as Harris Hawk, an American species which is not a falcon.